Preheat your oven to 375 degrees and position the rack in the middle. Melt 3 tablespoons butter in a large (10-inch) skillet with ovenproof handle, preferably nonstick, over medium heat. Swirl butter in the skillet until it turns nut-brown, sprinkle the brown sugar over the butter and lay in the peaches in a single layer. Sprinkle with lime zest and set aside. In a bowl, whisk together the flour, salt, baking soda and baking powder. Using an electric mixer (fitted with paddle attachment if you have one), cream the butter and sugar, and vanilla until fluffy. Add the egg, and beat until combined. With the mixer on low speed, add 1/3 of the dry ingredients, beat until combined, then add 1/3 of the yogurt. Continue alternating dry and wet until all are added. Scoop the batter over the peaches, spreading it to cover them evenly. Slide the skillet into the oven and bake about 35 minutes, until the cake is golden brown and springy to the touch at the center. Remove and let cool about 10 minutes. Invert a plate over the skillet, then, holding plate and skillet firmly together with towels or pot holders, invert the two in one swift movement. Remove the skillet and the cake is ready to serve. It’s best right from the oven. why is there not a print button? Would this work in a cast iron skillet? No egg in ingredients list. How much egg? No egg is listed in the ingredients ? It’s one egg. Thanks for catching that, everyone. We’ve updated the recipe. The recipe for the Peach-Lime Skillet Cake does not mention eggs in the ingredients, only in the instructions. How many eggs should be used? Thanks, and as a side note, you have one of the most enjoyable TV shows on the air. No matter the time of day, I become instantly hungry when I watch your show! Congratulations on all of your accomplishments and continued success! 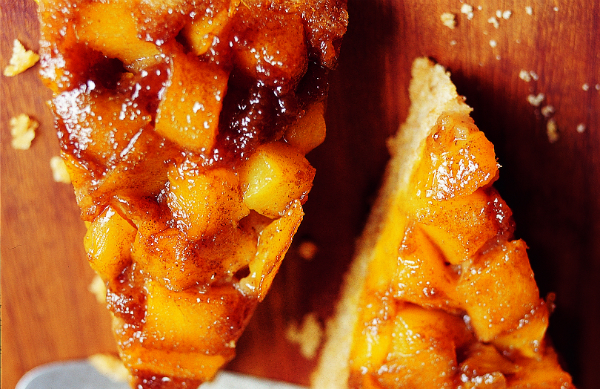 By all means, this recipe can be made with peaches cut into chunks. Just made peach-lime skillet cake. Turned out awsome. Thank you. This was PHENOMENAL! Peaches are in season and this was a delicious and easy recipe to make. I added some cinnamon and cayenne to the batter and actually made it gluten-free. It barely lasted a day. Thanks for the great recipe!